Nationwide Listings For The First Breakfast Cereal in Plastic Free Pouches – It’s Troo...! 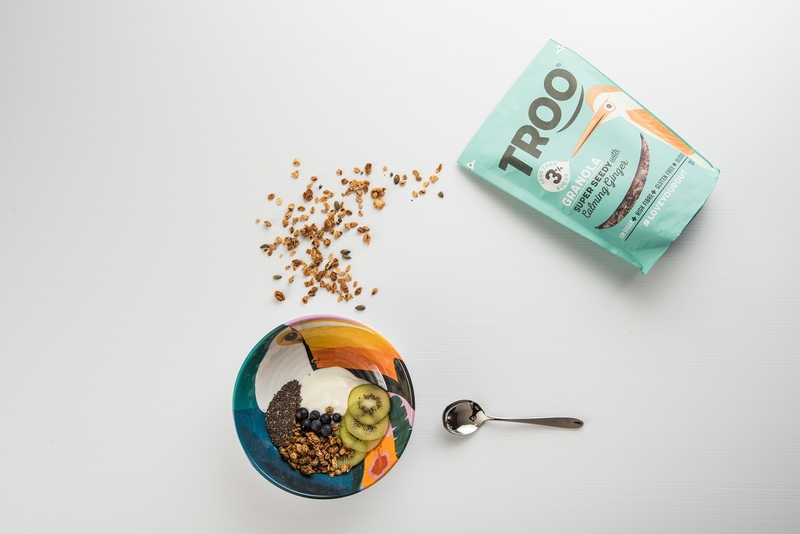 The first breakfast cereal in plastic free pouches, launched by foodie start up TrooFoods Ltd is now available nationwide, just a few months after launch. With listings in Ocado, selected Waitrose stores, Planet Organic, Selfridges and Harvey Nichols Troo can now be purchased up and down the country. “We’re delighted with the trade’s response to our new packs” explains co-founder Helenor Rogers, “in just 5 months we’ve got some huge listings, and hopefully this is just the start. Choosing to be plastic-free has certainly made us stand out from the crowd”. Retailers are starting to make changes themselves with regards to being plastic free; Selfridges announced they were removing drinks in single-use plastic bottles whilst Waitrose will stop using plastic lined disposable coffee cups in a move that will save 52 million cups a year. Troo Granola also ticks all of the boxes in terms of current food trends, in particular gut health. Designed specifically to be gut healthy, it contains only natural ingredients, is free from everything apart from nuts and is packed with prebiotic fibre, essential nourishment for your good gut bacteria. “Only last night a BBC Health Programme covered Gut Health; it is fundamental to our health and wellbeing. We want to help people understand the importance of eating a fibre-rich, varied, largely plant-based diet” says Helenor. However, does it taste good? “We’ve sampled hundreds of people in stores over the past few months, and had some fantastic feedback” Helenor explains, “our granola tastes of what it is made from rather than sugar – people like that”. The combination of a tasty, healthy product in sustainable packaging is going down well with the retailers and with consumers; a product that is good for us and good for the world. TrooFoods is on mission to inspire people to be passionate about gut health and to bring a smile to gut healthy eating through their range of delicious high fibre, low sugar, gluten free products in plastic free packaging. Kicking it off with breakfast; they are launching a scrumptious range of ready to eat Troo Granola especially designed to provide a gut healthy start to the day. One bowl provides more than 25% of your daily fibre needs; is less than 3% sugar and has as much protein as an egg. Packed with prebiotics it also provides slow release energy and keeps you full ‘til lunch. Husband and wife team, Helenor and Michael Rogers are behind TrooFoods Ltd. They set up their ambitious family business after 25+ years each in the corporate world. Passionate about food and health; they want to inspire others to eat better to enjoy a healthy, happy life. The First Breakfast Cereal in Plastic Free Pouches – It’s Troo...! © Copyright 2019. TrooFoods Ltd.